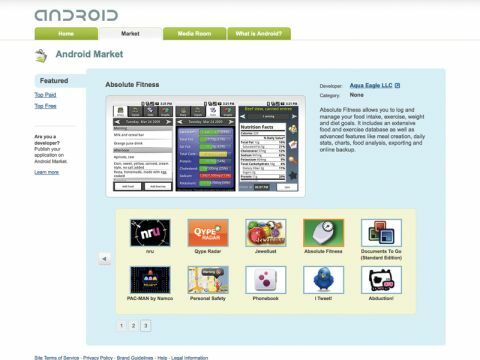 In many respects the Android Market is the opposite of the App Store. While Apple vets everything, the Android Market is a free-for-all; while Apple offers a desktop and a mobile version, the Market site is useless if you don't access it via an Android device. The Market's interface is basic rather than exciting, and there are some more significant omissions from its service. You can't view any screenshots, and the lack of vetting means that there's a risk of unscrupulous developers uploading bad apps. In addition, currencies are set according to where the developer is, not where you are, which can be frustrating. However, if you don't like an application, there's a handy 24-hour refund policy. With iTunes, sales are largely considered final. The Market's biggest problem is a distinct lack of applications. Of the 1,000-odd available apps, most are free. The most downloaded Android application in December was a free Pac-Man game, which attracted "more than" 250,000 downloads in a month; Sega's Super Monkey Ball on iPhone, a £3.49 purchase, shifted 300,000 copies in 20 days. Smart developers will follow the money, which isn't here. It may host some great apps in time, but we doubt it will ever push Android in the same way the App Store pushes the iPhone.